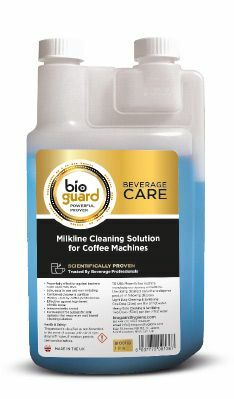 Here at Bioguard we are constantly innovating our product range to bring you the best scientifically proven beverage machine cleaning products. To reflect this innovation and the superior quality of our products, we have undergone a brand refresh with a new logo, new packaging and new product category name, Bioguard Beverage Care. This is our new logo which you will start to see more and more over the coming months. It has been designed to reflect the professional and high tech nature of our products but also give us a strong and recognizable identity that stands out within our industry. Based on your feedback, we’re also updating some of our product names to make it as clear as possible what each product does. Product codes will remain unchanged so you’ll easily be able to re-order what you need. We are doing a phased roll out of our new packaging so there will be a period where you will see the old and the new packaging. However, our product formulas all remain unchanged so there will be no compromise to our product quality. If you have any questions relating to the new packaging, please feel free to call or email Bioguard.